The Show Car Wax for Perfectionists! Superior On All Dark Color Paints. Achieves An Unmatched Wet-look! Pinnacle Souverän Paste Wax is for enthusiasts who appreciate the deepest, wettest, and richest shine possible from their automobile's paint. Formulated with pure “Ivory” Brazilian Carnauba and carefully selected natural oils, Souverän dazzles with a liquid shine that shimmers across your body panels. This three dimensional shine is breath taking. It forces you to park your automobile and walk away, just to so you can turn around and admire the look. Pinnacle Souveran can be applied by hand or machine; one jar provides up to 30 applications! Pinnacle Souverän Paste Wax is rich in tradition. For over 20 years, automobiles treated with Souverän have garnered stares of admiration and have dominated the most prestigious car shows in the world. Ralph Lauren's 1930 Mercedes Benz SSK “Count Trossi” won The Pebble Beach Concours d'Elegance in 1993 with this premium grade wax. You will enjoy the same award winning looking every time you step foot into your garage. While all colors will benefit, Pinnacle Souverän is most dramatic on dark colored vehicles. It creates a signature look that radiates, breathing life into your paint under changing light. Pinnacle Souverän is hand crafted beyond excellence. Creating an award winning wax is a challenge that can only be overcome with passion. Each continues to be made to the same standard for over 20 years. Brazilian T1 grade carnauba is the finest natural wax in the world. It is only the starting point. T1 grade carnauba is yellow in color, but Pinnacle Natural Brilliance refines the wax, removing impurities, and leaving it pure white. This “Ivory” carnauba wax is then hand crafted with select natural oils, and carefully cooked to produce a premium carnauba wax for enthusiasts as passionate as the people who formulate it. Only after each batch is checked multiple times to meet quality standards is it hand poured and allowed to cool in a controlled environment. Opening a jar of Souverän is just the beginning as your sense of smell is overwhelmed by the natural, pleasant scent of Pinnacle's flag ship carnauba. Pinnacle Souverän is best applied with the soft, included foam applicator. As you swipe the applicator over the wax you will see it melt on the pad. Now massage Pinnacle Souverän onto your paint work, a section at a time. It will melt into the paint. Using the supplied microfiber cloth, buff the section clean while Souverän™ is still wet. Repeat until your automobile is dipped in visual perfection. Souveran brings out the depth and clarity of the paint on this 2009 Victory Red Metallic Corvette convertible. For the absolute best results, gently wash your automobile with Pinnacle Bodywork Shampoo first, and dry carefully. Use the extremely fine Pinnacle Ultra-Poly Clay to remove any foreign contamination from your paint work, restoring it's original luster and leaving it perfectly smooth. Finish preparing your paint with Pinnacle Paintwork Cleansing Lotion. Then bathe your in the rich, three dimensional shine of Pinnacle Souverän Paste Wax. Note: Pinnacle Souverän does not contain cleaning agents or harsh solvents. It can be a layered for more shine and will not stain trim. This by far has been the best wax product I have ever used. It went on super easy and came off the same. The deep shine is outstanding. I liked it so much I clay bar all the cars and topped it off with the Pinnacle Souveran Carnauba Paste Wax the it finished it off with a deep rich shine that I have received many complements. ProsGoes on easy and comes off the same. Excellent product to work with. So advanced in ease of application and delightful in results! The shine is exceptional. This is a car wax that is worthy of its pricing and adulation. Excellent product. Easy to apply. Cars have deep brilliant shine. Thought product was on the expensive side but it is worth the price. Cars look showroom new! Yes, so it doesn't last long, but either do other beauty waxes. It's so easy to apply that you wont mind doing it every month or 2. Nothing looks better on dark colors. It's stunning. Apply thin and you will get tons of applications out of a jar. With this in mind, the price point isn't too bad. ProsBest looking LSP for dark colors. I mean it smells good, does that make it worth $95.00? It goes on smooth and wipes off easy. I read that It lasts 6 months? Ha! Maybe on a garage queen but most definitely not on a meticulously detailed daily driver. You open up the lid and dip your applicator in the jar and its like putting a hot knife in warm butter. Spreading it across the paint is unbelievably smooth, it doesn't feel like your waxing your car. More like putting silky lotion on newly shaved legs. The smell is sort of chemically derived but otherwise and surprisingly pleasant. There is hardly a better looking wax on darker colored vehicles. I cannot comment on lighter colored cars however I would guess it would be a warm tintish glow. I love this wax. I'd trade my girlfriend for another jar if it lasted just a little bit longer. I have used many waxes over 40 plus years of detailing cars and trucks and this is the easiest to apply and makes your paint look deep and glossy no matter what the color. I am using it on my white Chevy Silverado Crew Cab Dually and it takes very little product to cover a vehicle of this size. There is no wax residue left to clean-up after and my paint has never looked this shiny and deep. Excellent product and will purchase again, the sticker shock was a bit much but Pinnacle Souveran Paste Wax is well worth the money. This wax is incredible. Apply and wipe off. That easy. It is a nice wax indeed. I got this for free from Autopia CONNECT deals. It is well worth it! This is top rung of the ladder, and would hold up well against more expensive products. 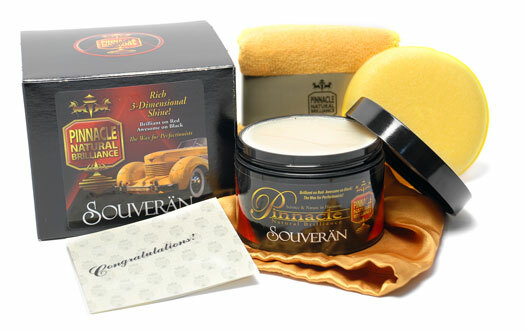 Using this on a Black Hemi Jeep, Pinnacle Souveran Wax is a true delight to the senses. ProsGot this as a freebie with Connect membership. Many many Thanks Autopia!!! I've used Souveran for over 15 years on three different Porsches. It is by far the best wax I've ever used. The shine is amazing! Application and buffing is quick and easy, almost effortless. Even though it is expensive, with roughly monthly use, one tub lasts me 3-4 years. In the long run the cost is actually quite low ... and well worth it. I own a black F 250 and this is the best wax I have ever used!!!! Really nice product , Applies really easily and buff off the same. Makes my 71 Hemi Orange pop. Excellent product. Wipe on then wipe off. Leaves my black paint so bright. Proseasy to use, do not have to wait for a haze. Consprice is a bit high. First of all, I purchased Mike Phillips' book on-line regarding The Art of Detailing - a must read for anyone really interested in detailing their own car. Must tell you that after spending about 20 hours washing, claying, applying a Pinnacle corrective polish, followed by their finish polish, and finally using Pinnacle's Souveran Carnauba Paste Wax, my car just glistens - so very happy with the results. Took it out the other day for a ride and had several people pass me and strained the heads as they acknowledged my cars finish. ProsThe Pinnacle poliishes and wax along with the various pads worked extremely well. ConsWhat's not to like, everything worked very well. This is by far my favorite wax. It goes on and off easy and leaves you with a fabulous mirror like shine. I do not use it on my everyday driver however because it is way too expensive and doesn't last long. Overall great product though. ProsEase of use; mirror like finish. Purchased in 2008 and still fresh. It seals very well. Prossmooth and easy to wipe off.